The Mini Link Hydraulic System features a hydraulic meter and cylinder to drive the metering system, delivers an extremely consistent mix/meter of materials at low flow rates, ideal for low & high pressure applications, and more. Two magnetic proximity switches for rapid pump reversal change. Fluid sections are constructed from stainless steel. 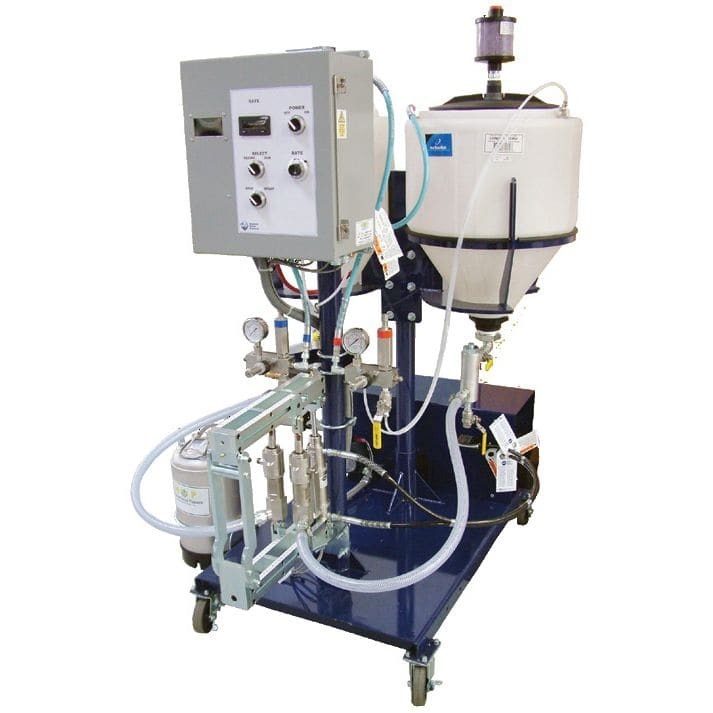 The Mini Link system uses a hydraulic motor and cylinder to drive the metering system, which delivers an extremely consistent mix/meter of materials at low flow rates not possible with a pneumatic drive system. It is ideal for low and high pressure applications with material viscosity from 20 cps to 40,000 cps, at flow rates under a half gallon/minute (1.893 L/min.). This is a critical requirement when injecting mixed/metered resin into a pultrusion die, maintaining proper glass to resin ratios with almost no waste. The hydraulic pump reversal is achieved using two magnetic proximity switches for rapid pump reversal change.